Dominating agricultural system – Soil and climatic conditions in the region favour the cultivation of all crops. The crop system is predominated by wheat, corn and sunflower. Cereals have the largest share – 56.5%. Besides major grain production the region accounts for 30.8% of total vegetable crops at national level, 28.1% of the areas of fruits and 26.7% areas of vineyards. There is a small proportion of forage crops. Although cotton occupies only 1.5 percent of arable land in the region, the region is the main national cotton producer because it accounts to 89.5% of the total area of cotton production in Bulgaria. More than half of national tobacco production is from the region. More than 50% of the country land under apples and one third of table grapes are located in the region. The most distributed vegetable crops are green pepper, potatoes and tomatoes. The region provides more than half of the production of oriental tobacco, pepper and apples of the total national production. 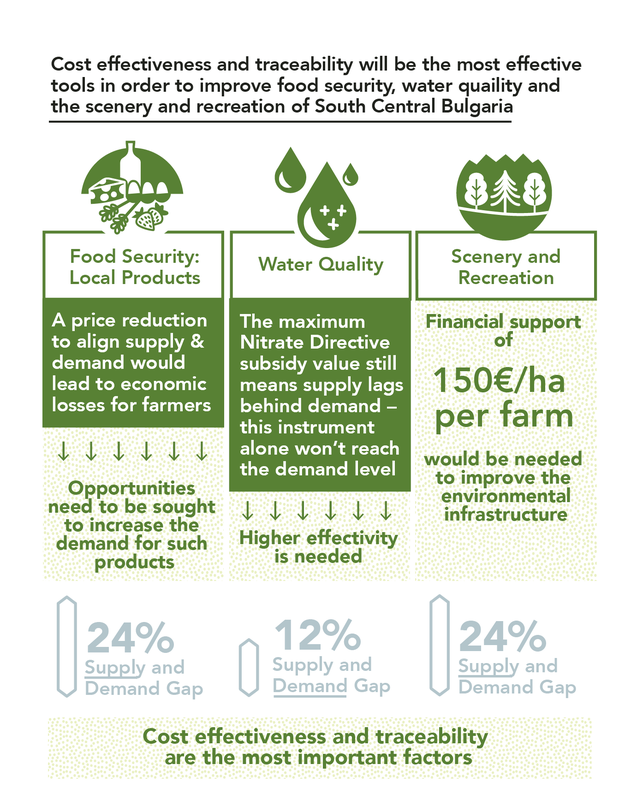 Yields of most of the crops are higher than average crop yields obtained in Bulgaria. The livestock is well developed in the region and includes various animal species – cow, sheep, goats, birds, pigs. The region produces more than one third of the total quantity of milk in the country – accounting to 34.8 percent. 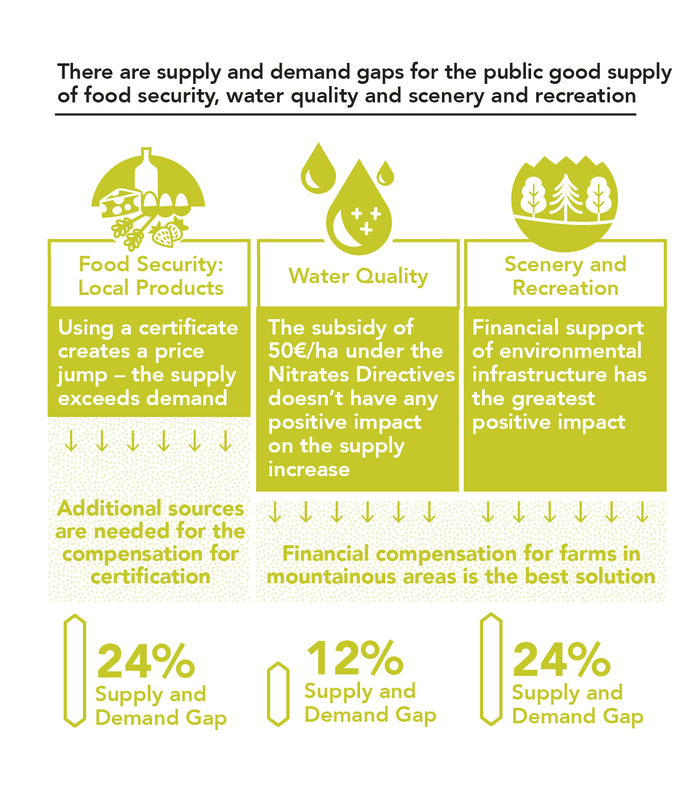 Specific natural basic conditions that are important in respect to public good provision (such as climate, geomorphography, soil conditions, etc.) – The terrain is extremely diverse. The area covers a large part of Rhodope Mountains, Sredna Gora (mountain) and Sakar Mountain. Lower parts of the area covering the Upper Tracian Valley it is formed around the catchment areas of the River Maritsa. Kardzhali and Smolyan districts are located in the mountains, while others combine mountains with valleys. The landscape suggests significant differences in the climate of parts of the region. Agriculture in mountain areas has a secondary function which is determined by the specific soil and climatic conditions of the area and the relief, which creates difficulties in utilizing the land. Until recently, the main crop in mountainous areas was tobacco. But there is a tendency to reduce its share in the structure of the agriculture. Soil cover in SCR is closely related to the specific combination of bedrock, the peculiarities of the relief, the direction of the radial movements of the earth crust, climatic conditions and human activities that determine the considerable diversity of soils in the region. They can be characterized as: deep soils in lowland areas with soil types: typical cinnamon forest soils, leached cinnamon forest soils, leached vertisols, pseudopodzolic soils, alluvial meadow soils, swamp soils, saline soil ; and shallow soils in the hilly and mountainous areas with soil types, humus carbonate soil, shallow cinnamon forest soils, brown forest soils, brown soils with humus-carbonate soils. The landscape of the territory is defined as mostly pastoral – with small, well-managed fields and meadows utilized in the traditional way. Mountain pastures and hay meadows are inherent for the territory. Grazing animals on pastures are sheep and cows. Some pastures and meadows are underutilized and they slowly turn into forest. Agriculture in the region is defined as „self“ production mainly for its own needs and inhabitants selling the surplus only. Primary products are potatoes, tobacco and Smilyan beans as well as animals for milk and meat. Mountain farming in combination with unspoiled nature and the lack of polluting enterprises guarantee the high quality and purity of the produced agricultural products. There is potential for registration of geographical marks. Over the past three years many organic farms have been certified, organically grown are mainly herbs, chokeberry and raspberries. Livestock is presented primarily by individual animal owners and can be attributed to the so called „small farming“ – on individual holdings. It covers the predominant share in the statistical data. There are only a few large farms. After a brief decline in the registered number of farmers in the area in the last year an increase was noticeable, which is a prerequisite for a real increase in investment in agriculture through the opportunities offered by European funds through the Programme for Rural Development. Prospects for the development of Agriculture concluded in overcoming fragmentation, land consolidation, creation of agricultural associations, cultivation of new crops, improving quality of the nursery and finding new markets. The area is notorious with its public goods – water quality and availability, food production and security, wood production, scenery and recreation. Although they are available in good levels there are some negative trends in their developments. They need to be governed by proper mechanisms in order to be maintained and developed in the future. The existing mechanisms do not stimulate locals to perform actions assuring supply of public goods. (Is the agricultural management too intensive at the moment?) Governance mechanism do not reach small farmers. There is lack of association or producers groups. Local food security is weak because of not enough regional brands of food. There is no developed short chain distribution. The agricultural management is already good and the relevant improvements should be done in the following areas: Financial incentives (subsidies, local development programmes) and advisory services and information. They must provide interactions between public goods and public bads – mainly for food and wood production, water quality and landscape. There is a need of creating initiatives among farmers and forest owners to apply sustainable management practices. Adequate public financial support will be crucial for implementation of such activities. After the discussion with the stakeholders the main public goods which need to be provided with improved governance mechanisms and should be investigated in the context of the case study are: water quality, food security and scenery and recreation. Here you find outcomes of the participatory workshops and material concerning the region in national language.